Thanks to everyone who wrote to Historic England in support of our stadium plans. 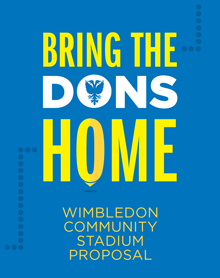 Click the yellow button below to show your support for bringing the Dons home. To return Wimbledon’s football club to a stadium in Plough Lane and create a significant community asset for Merton. Expand the key pledges below or read about the plans in more detail in our FAQ. Research estimates that a new community stadium will provide a total annual financial injection to the area of £12.7 million. The club’s long term vision for the stadium is closely aligned with the council’s economic development strategy for Merton. The plans will develop a large currently rundown site on Plough Lane and act as a catalyst to improve the whole area. The plans include not only a stadium but also 600 residential units, car parking, retail and commercial space, a leisure club and other facilities. A new stadium will enable AFC Wimbledon to extend its sports participation projects. 14 dedicated youth coaching personnel currently provide 900 contact hours a season in After School Clubs, Saturday Football Club and Holiday Football Courses. AFC Wimbledon has prioritised community work since it was founded. It was given a Big Society Award by the Prime Minister in 2012 in recognition of this. A new base in the borough will allow the club to expand the scope of these schemes still further. AFC Wimbledon’s success since its (re)founding in 2002 has been remarkable. The team has risen from the Combined Counties League back to the Football League. And the club’s achievements have proved that a fan-run, community-focused, truly ethical organisation can compete in the professional game. A new ground back in the borough will end more than 20 years in exile and allow the club to set its sights still higher, firmly embedded once more in the heartland of the area it is proud to represent.